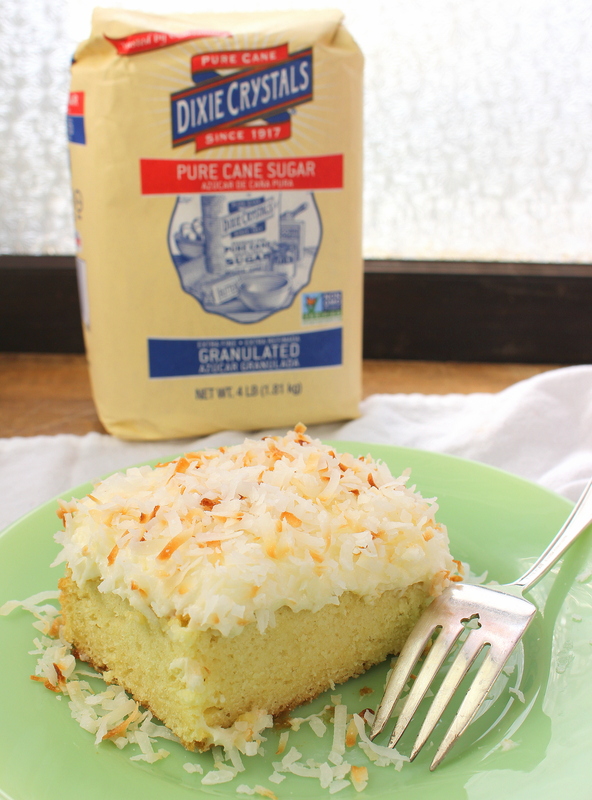 My recipe of the day is for an easy to make Coconut Sheet Cake, for Spring Sweets Week, which can be easily made in a 9×13-inch quarter sheet pan, making it perfect for the potluck dessert idea to feed a crowd. It’s made from scratch from top to bottom using Dixie Crystals sugars, and makes for one of the best coconut cakes I have ever eaten. When I made it, I started with a recipe from Bake from Scratch magazine, but that had to have some course corrections as it wasn’t working out as advertised. Luckily I make cakes all the time so fixing the issues was not a problem. I also added some flavoring touches of my own, like the hint of almond, which makes the cake ever so slightly remind one of an Almond Joy. I also added lots and lots of coconut. Not too much, mind you, but I always enjoy a fully loaded coconut cake. I hope you do as well. Spring Sweets Week will be going on all week long with lots of yummy recipes from associated bloggers as well as a giveaway. Click the link below to go to the Welcome page and read about the prizes as well as sign up for the drawing. And be sure to check back all this week for other new recipes. I am proud to have had Dixie Crystals sponsor this post and provide product ingredients for the making of this fabulous dessert! Now here’s a cake you can really sink your fork into! Here’s a peek at the cake batter in the pan, waiting to become sumptous! And after baking with the golden top, waiting to be put to bed with yummy coconut frosting. And of course, all dressed up and ready to go. Everyone made quick work of this cake here! Would you like a slice? Serve with ice cream if you like! Spray a 13x9-inch baking dish with Baker's Release spray (or grease and flour). In the mixing bowl of an electric mixer fitted with a paddle attachment, cream butter and granulated sugar until smooth. Add 4 egg yolks plus the extracts and 10 ounces of coconut milk and mix briefly. In a separate bowl, stir together cake flour, baking powder, baking soda and salt. With mixer running, add flour mixture gradually. In a separate mixing bowl on the electric mixer fitted with a wire whip, beat egg whites at high speed until stiff. Fold egg whites gently into cake batter. Using spatula place cake batter into prepared cake pan. Bake the cake in the preheated oven for 40-45 minutes or until a toothpick can be inserted and removed without wet batter (moist crumbs are fine). Allow cake to cool completely in the pan. To prepare frosting, whisk together softened butter, extracts and powdered sugar with about 7 tablespoons of coconut milk (should be the rest of the can) until smooth. Toast coconut until lightly golden - do not burn. Spread icing on completely cooled cake and top with toasted coconut.